Converted materials are typically produced in continuous sheets, rolled for more convenient handling and transportation. Roll weights that can be carried directly by a robot can vary from less than a pound to over 2000 pounds and diameters from less than an inch up to 96” or more. As a Level 4 Certified Servicing Integrator of FANUC America, MCRI has complete access to the widest range of four and six-axis robots in the world – allowing us to select the absolute best fit robot for your requirements. 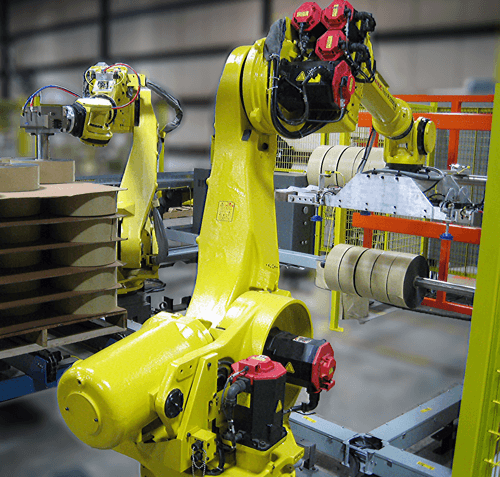 MCRI supplies robotic work cells to a variety of converting companies, from construction material manufacturers to personal care products to primary metals companies. MCRI has robotic solutions for processing and packaging raw materials such as polyesters, adhesives, silicone, tapes, foams, plastics, felts, rubbers, liners and metals and other materials. Like many other manufacturing segments, converting companies face the challenges of SKU proliferation and shorter production runs. A well designed robotic work cell can provide the flexibility necessary to handle and process a wider range of products. Fast changeover times, sometimes on the fly change capability, can be incorporated into robotic work cells. Whether you are printing, laminating, coating, slitting, or any combination of these steps, contact MCRI for robotic solutions to move your rolls through your processes and out the door, in whatever final package you require – jumbo rolls, slit rolls, sheet and collated sheet products, or formed products.